On August 17, 2015, there were opening day protests in the Los Angeles Unified School District LAUSD, at the Hobart Elementary School, over the removal and retaliation against star teacher Raif Esquith; the co-location of a charter in the Stoner Elementary school that steals rooms from the public school; and a protest against the Eli Broadway foundation offices for pushing privatization and charters. LOS ANGELES - March 5, 2010 -- Nationwide student demonstrations took place yesterday. Here in Southern California reports are still coming in of actions on the campus of every public university and college in the region. There was also a large march and rally in downtown Los Angeles students, parents and teachers marched against privatization of the public schools at the K through 12 level. 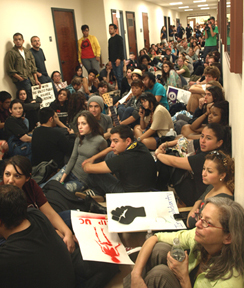 UCLA students staged a 5 hour sit-in at the chancellor's office demanding to met with him. The only response from the office was from a vice chancellor who stated that there would be no statement or meeting. In addition to the sit-in there were a number of rallies, marches and teach-ins on the UCLA campus. UCSD, UC Riverside, UCSB, Cal State University Northridge and many others are also reporting sizable student actions throughout the day. STATEWIDE - March 3, 2010 - Campuses across California have exploded in protest, leading up to the large demonstrations planned on March 4th to demand the right to a public education - PRE, K-12, and COLLEGE. 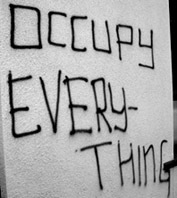 For Breaking News, to see what's happening on March 4th, in real-time, see our March 4th Student Actions page. The list of actions reported on the LA IMC newswire, below, is only a partial list of numerous large and small actions students have taken to protest the sustained attacks on public education. The protests have enlarged to include all levels of budget cuts aimed at social services. Please click to contribute your links to the March 4th Updates page.